A 61 year old man with a several years’ history of chronic pancreatitis and complex partial seizures was referred to endocrinology with low serum thyroid stimulating hormone (TSH). At the time, examination was normal, and pituitary function tests revealed secondary hypothyroidism and secondary hypogonadism with normal prolactin and normal 9am cortisol. Magnetic resonance imaging (MRI) of the pituitary gland showed an 8 mm infundibular mass with elevation, but not compression of the optic chiasm. Thyroxine and testosterone replacement were commenced. 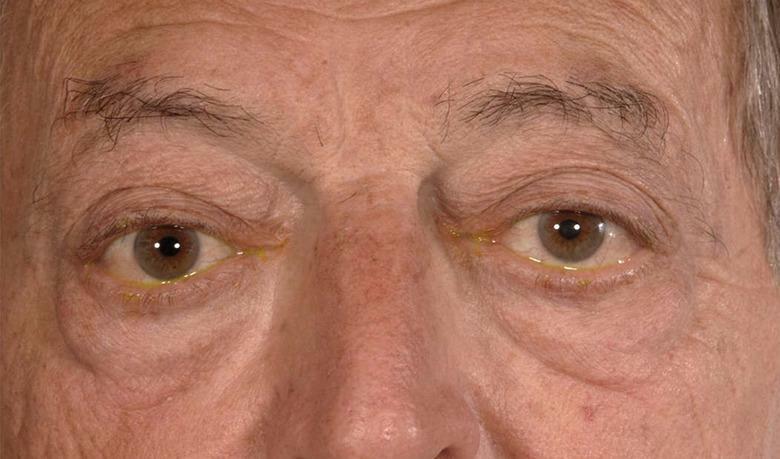 His condition was stable for three years, after which he presented with an acute flare of pancreatitis, associated with painful, bilateral exophthalmos (fig 1). He was clinically and biochemically euthyroid on thyroxine replacement. Repeat MRI showed an increase in the size of the infundibular mass, and bilateral extra-ocular muscle expansion with lacrimal gland swelling. Bilateral inflammation of orbital tissue with yellow exudate. What is the most likely unifying diagnosis? What is the definitive investigation to diagnose this condition? 1. What is the most likely unifying diagnosis? This patient’s multiple pathologies (pituitary gland mass, exophthalmos, dacryoadenitis, chronic pancreatitis, and seizures) are suggestive of IgG4-related disease. Consider IgG4-related disease with any combination of multi-organ inflammation, including pancreatic, ocular, pituitary, salivary gland and retroperitoneal fibrosis. Typically, patients are male and over 40,1 and onset is subacute and insidious. Patients may present to different specialists with a variety of symptoms. IgG4-related disease is an immune mediated inflammatory condition. The pattern of organ involvement is unpredictable and initial diagnostic uncertainty is common. Classically, it presents as single or multiple organ inflammation, most commonly dacryoadenitis, sialadenitis, and autoimmune pancreatitis,2 although involvement of several other organs including the pituitary gland has been described. Our understanding of the epidemiology and pathophysiology of IgG4-related disease continues to evolve. The estimated prevalence is 6.27/100 000,1 but this is probably an underestimate. Many cases remain undiagnosed because of a lack of clinician awareness and knowledge of the condition. 2. What is the definitive investigation to diagnose this condition? Tissue biopsy with immunostaining for IgG4-positive plasma cells is the gold standard investigation. Supportive tests include biochemical and radiological investigation of affected organs. Tissue biopsy is based on the presence of the classic triad of lymphoplasmacytic infiltration, storiform fibrosis, and obliterative phlebitis,5 with a predominance of IgG4-positive plasma cells. As both the absolute number and proportion of IgG4-positive cells varies in different tissues, there are now organ specific histological criteria for this diagnosis. Although a pituitary stalk mass (fulfils criteria for pituitary involvement,6 radiological imaging is insufficient for definitive diagnosis. Serum IgG4 levels may be raised in IgG4-related disease and forms one of the diagnostic criteria. There is some evidence of a positive correlation between serum IgG4 levels and the number of organs involved,7 and an association may exist between extra-ophthalmic involvement and higher serum IgG4 levels.8 Serum IgG4 levels lack diagnostic sensitivity but may have a role in monitoring disease activity and assessing response to treatment. 3. How would you manage this condition? Consider steroid-sparing agents (eg rituximab, azathioprine, mycophenolate mofetil and methotrexate) for potential side effects of long term steroid treatment. Offer multidisciplinary team input for managing the long term multi-system sequelae. Treatment strategies for remission maintenance and second-line immunosuppression vary. More prospective clinical trials into remission maintenance and the use of second-line immunosuppressive drugs are urgently needed. These are challenging to conduct because of patient heterogeneity due to disparate organ involvement and the waxing and waning natural history of the disease. There was rapid improvement in proptosis and chronic pancreatitis (steatorrhoea) after starting 60 mg prednisolone daily, and there was reduction in the size of the pituitary mass. The patient developed steroid induced diabetes and required insulin treatment. The patient was weaned off prednisolone and remained in complete remission for three years before re-presenting with acute pancreatitis. A second course of systemic glucocorticoids controlled the condition, but 14 months after glucocorticoid cessation the disease relapsed again, this time with painful proptosis and a substantial increase in the size of the pituitary stalk mass. Remission was achieved on a third course of steroids and he remains on long term low dose prednisolone. •	Consider IgG4-related disease in patients with organ inflammation, particularly those with any combination of pancreatitis, dacryoadenitis, sialadenitis, and retroperitoneal fibrosis. •	Early recognition, accurate diagnosis, and prompt immunosuppressive treatment can preserve organ function.